Rules are important. They give us both purpose and direction. The first definition for rule in the Merriam-Webster Dictionary is – “a prescribed guide for conduct or action.” Rules tell us what is expected of us if we become participants in any type of life activity. Most martial arts systems have rules for conduct and action. 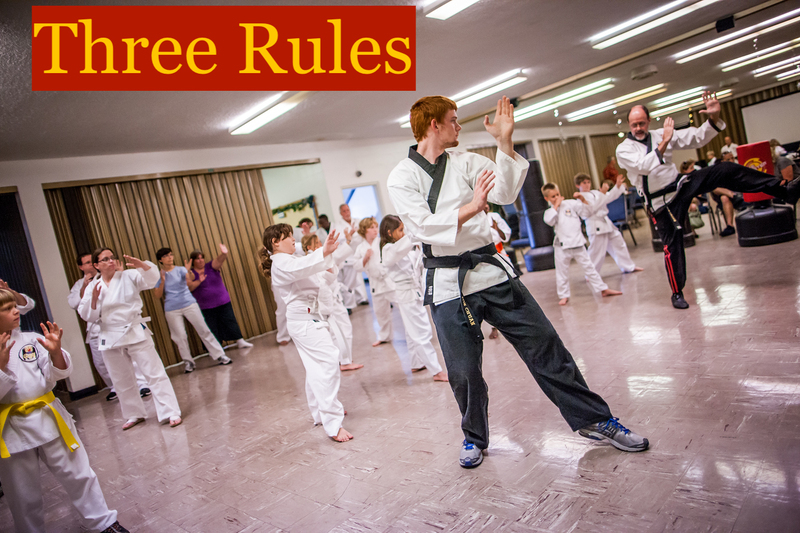 During the coming weeks we will share with you several “Rules of Three” that are part of Grace Martial Arts. Yon Ch’uan has 3 Zones of Engagement. Each Zone has its own unique advantages to defending self and others. Our training begins in Zone 3. The advantage of being in Zone 3 is that you probably will not have to engage in physical self defense as long as you are aware of your situation (situational awareness). We call that 60/360 awareness. The next part of our training moves to Zone 2. The advantage of being in Zone 2 is that you can use a variety of escape skills to quickly find an exit that keeps you from being physically attacked (exit strategy). Zone 2 is anytime you are within reachable distance from a person or persons who may want to harm you. If they are close enough to grab, push, pull, tackle, hit or kick you, you and anyone with you are in danger. In fact, Zone 2 may be the most dangerous place for you since you may have only a split second to decide what to do to keep yourself and others who are with you safe. The optimal choice is to move yourself (and others) from Zone 2 to Zone 3 so the potential attacker(s) can’t reach you without making movements toward you. If the attacker(s) moves toward you after you have moved a safe distance away from him, you may need to use self-defense techniques learned for the 1st Zone. The advantage of being in Zone 1 is that you can use your training in evasion to escape or enter depending on which option is better. Zone 1 defense techniques include escaping, blocking, striking, trapping and throwing. Grace Martial Arts instructors teach these techniques from aspects of effectiveness, efficiency and legality. We will look at another set of Rules of Three for Yon Ch’uan Martial Arts when our special series continues next week.